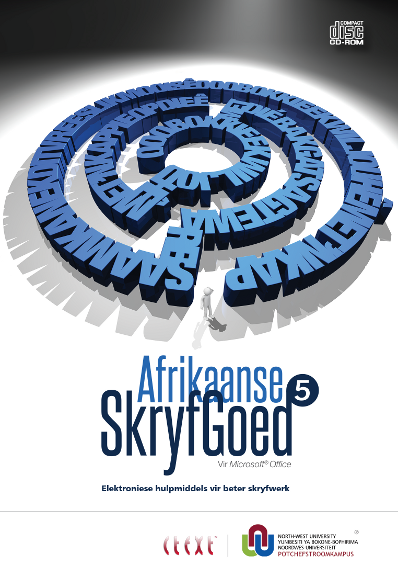 Afrikaanse SkryfGoed 5 for Microsoft® Office! As the only so-called second-generation spelling checker for Afrikaans, the Spelling Checker is the most advanced Afrikaans proofing tool. This means that it applies complex processes like morphological analysis to evaluate words instead of merely comparing them to the entries in a word list (which is the case for many spelling checkers). This tool offers good suggestions and alternatives for spelling errors, automatically recognises new compounds and inflections, and boasts comprehensive word lists. Grammatically correct constructions (for example “lelik boom” versus “lelike boom”). Based on extensive research at the Centre for Text Technology (CTexT®), North-West University (Potchefstroom Campus). Microsoft, Encarta, MSN, and Windows are either registered trademarks, or trademarks of Microsoft Corporation in the United States and other countries. If you want to use this product on more than one computer, please contact verkope@spel.co.za for a quote on licensing.